To Cite: Taghizadieh A, Soleimanpour H, Rahmani F, Shahsavari Nia K, Khodaverdizadeh H. Comparison of Serum Levels of Procalcitonin and C-Reactive Protein in Patients with Community Acquired Pneumonia and COPD Exacerbation, Iran Red Crescent Med J. 2016 ; 18(12):e25811. doi: 10.5812/ircmj.25811. Background: Pneumonia is an important and commonly occurring disease, with significant morbidity and mortality. Community acquired pneumonia (CAP) is associated with a very rapid rise in procalcitonin (PCT), which has been considered a primary marker of bacterial infection. Objectives: The aim of this study was to compare the serum levels of PCT in patients with CAP and in patients with acute exacerbation of chronic obstructive pulmonary disease (COPD). Methods: This cross-sectional prospective descriptive study was performed in the emergency department (ED) on patients with CAP and acute exacerbation of COPD. A total of 53 patients were included in this study and their serum levels of PCT and C-reactive protein (CRP) were measured. Results: The patients included 31 males and 22 females with a mean age of 76.52 ± 9.93 years and a mean BMI of 25.98 ± 3.04. The mean PCT level was 0.93 ± 1.56 in patients with CAP and 0.29 ± 0.27 in patients with acute exacerbation of COPD; the PCT level was significantly higher in the patients with CAP (P = 0.049). The mean CRP level was 34.00 ± 12.37 in patients with CAP and 31.66 ± 11.73 in patients with acute exacerbation of COPD; this difference was not statistically significant (P = 0.483). Conclusions: We found statistical differences in PCT levels that would differentiate CAP from acute exacerbation of COPD in the ED setting. Further studies are required to verify this finding. Overuse of antibiotics is a common condition in today’s society, and especially in hospitals, and is leading to antibiotic resistance and increases in nosocomial infections. This resistance includes the new penicillin resistant Pneumococcus and methicillin resistant Staphylococcus aureus strains that are now distributed around the world (1, 2). Reducing the steadily increasing consumption and administration of antibiotics by patients and physicians, respectively, can play an important role in decreasing antibiotic overuse, thereby reducing drug resistance and other complications, such as diarrhea and Clostridium difficile infections. Three main causes of antibiotic administration are community acquired pneumonia (CAP), exacerbation of chronic obstructive pulmonary disease (COPD), and asthma (3-7). Several studies that have investigated antibiotic use in asthma attacks and COPD have concluded that antibiotic use should follow precise international guidelines (1). While difference exist with respect to the guidelines, imaging modalities, and different culture routines for human body discharges, the need for rapid treatment in some patients has led to the recommendation of using specific markers for detecting the infections. Some of these tests are specific, while the rest are nonspecific. Two important and well-studied biochemical markers are C-reactive protein (CRP) and procalcitonin (PCT). Positive test results for these markers, and especially for PCT, even at low levels, can be used as an acceptable guide for antibiotic administration (8-12). These markers are valuable in checking the treatment responses and incidence of complications, especially in cases of acute exacerbation of COPD, where they are of great importance in the initiation of antibiotic administration (3, 8). The main aim of this study was to compare the serum levels of PCT and CRP in patients with CAP to those in patients with COPD. This was a cross-sectional prospective descriptive study conducted during a 12-month period (July 2012 - July 2013) in the emergency department (ED) of Imam Reza Medical Research and Training Hospital, Tabriz, East Azerbaijan, Iran, which handles 110,000 admissions per year. In the study period, 26 patients with CAP, verified by chest X-ray (CXR), and 27 patients with acute exacerbation of COPD were referred to our ED and these patients were enrolled in the study (Figure 1). We evaluated the PCT and CRP serum levels in all patients in both these groups. Sample size was determined by considering the primary information on PCT, based on the study by Bafadhel et al. 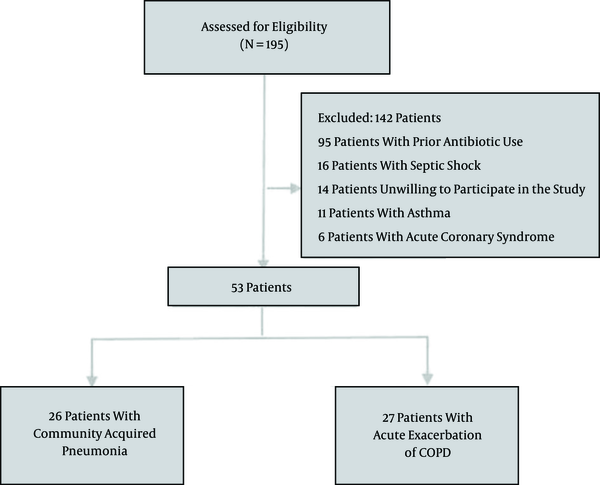 (1) [Pneumonia group: 1.27 (SD = 2.36) and COPD group: 0.05 (SD = 0.06)], a confidence level of 95%, a power of 80%, and utilizing the Pocock formula that indicated a required sample size of at least 24 patients in each group. Ultimately, 53 patients were selected. The sampling strategy was convenient, and inclusion criteria for the study were all patients with CAP or acute exacerbation of COPD. Patients with asthma, acute coronary syndrome, prior antibiotic use, and septic shock were excluded from the study. This study was approved by the ethics committee of “Tabriz University of Medical Sciences” and registered under the code number 6931 on 23 Oct. 2012. All patients and their families were informed about the diagnostic and therapeutic procedures. All procedures conducted on the patients were based on scientific principles. Written consent was obtained from all patients after a precise description of the aims and methods of the study. Patients arriving at the ED had their history taken and underwent a physical examination with the suspicion of CAP (fever, cough, dyspnea, and pleuritic chest pain, negative history of COPD) or acute exacerbation of COPD (dyspnea, cough, positive history of COPD). A CXR was taken for all patients. After the diagnosis, blood samples were taken from all patients for measuring the PCT and CRP levels. Sputum and blood cultures were also analyzed for all patients. The level of CRP was determined using a BT3000 instrument (Biotechnical Instruments Company, Spain) and commercial kits (Pars Azmon, Iran) based on the immunoturbidimetric method (sensitivity limit: 0.3 mg/L). The level of PCT was determined using a Cobas e 411 analyzer (Cobas Company, Roche, Germany) and an electrochemiluminescence immunoassay (ECLIA) method (normal range < 0.05 µg/L). The patients were followed until the end of the diagnosis period, when the final diagnosis was made. All collected data were entered into SPSS 15.0 and analyzed using appropriate statistical tests. Descriptive analysis tests were used for description of the data. We studied the normal distribution of the data using the Kolmogorov-Smirnov test. A non-parametric Mann Whitney U test was used in cases of non-normal distribution of the data. We used an independent sample T-test to compare the CRP and PCT serum levels in the two groups. We also used multivariate analysis when needed. We considered a P value of less than 0.05 to be statistically significant. Our study of 53 patients included 31 males and 22 females (the CAP group contained 12 males and 14 females, and the COPD group contained 19 males and 8 females). The Kolmogorov-Smirnov test revealed non-normal distribution of the age and body mass index (BMI) variables. The demographic and clinical data of patients with CAP and COPD exacerbation are shown in Table 1. Statistically significant differences were noted between the CAP and COPD groups; the COPD patients were older than the CAP patients and had a greater body mass index (BMI). We used multivariate analysis to eliminate the effects of these covariates on the main results (CRP and PCT). The differences in age and BMI had no effect on the CRP and PCT serum levels (P = 0.186). The mean PCT level was 0.93 ± 1.56 µg/L in patients with CAP and 0.29 ± 0.27 µg/L in patients with COPD (Median = 0.16 µg/L and Mode = 0.03 µg/L). Analysis of the PCT levels between the two groups revealed that the difference between the two groups was statistically significant (P = 0.049). The mean CRP level was 34.00 ± 12.37 mg/L in patients suffering from CAP and 31.66 ± 11.73 mg/L in patients with acute exacerbation of COPD. Analysis of the CRP levels between the two groups revealed no significant difference (P = 0.483). This study on the serum levels of PCT in patients with CAP and acute exacerbation of COPD was carried out because of the importance of the issue of antibiotic resistance and because of the existing challenges regarding the diagnosis and treatment of CAP. PCT rises very fast in bacterial infections, making it a good biomarker for bacterial infections (13, 14). PCT is a primitive marker of CAP and a level of 0.25 - 0.5 ng/mL is considered an indication for initiating antibiotic therapy. Similarly, measuring its decrease in the serum is also useful for antibiotic therapy decision making and mortality forecasting (15, 16). PCT is a valuable adjunct in the diagnosis of CAP and complements the other clinical signs and symptoms (17, 18). Stolz and colleagues (19) reported a low sensitivity and specificity for the signs and symptoms of lower airway infections when making an antibiotic therapy decision. They concluded that a CXR with signs of infiltration, together with a CRP level higher than 50 mg/L and a PCT higher than 0.1 ng/mL, was useful for starting antibiotic therapy. Another study suggested that the PCT level could be used as a guide for antibiotic therapy and could effectively reduce the inappropriate use of antibiotics (20). Holm and colleagues (21) showed that a PCT value of more than 0.06 ng/mL and a CRP value of more than 20 had a significant correlation with radiologic evidence of pneumonia, bacterial infection, and hospitalization of patients, whereas both markers had a low positive predictive value as inflammatory markers. Masia and colleagues (22), in a similar study, showed that the PCT serum level differed with the severity of the disease. This indicated that the PCT level has a role in evaluating the CAP microbial etiology and can also serve as a prognostic factor in high-risk patients. In our study, the serum PCT levels were significantly higher in patients with CAP (0.93 ± 1.56 µg/L) than in patients with acute exacerbation of COPD (0.29 ± 0.27µg/L), but no significant difference was noted regarding CRP. The statistically significant differences between the two groups for age and BMI were eliminated by multivariate analysis. The results from the present study agreed with those reported in previous studies (1, 23). The limitations of our study were that we did not follow up our patients after admission to hospital wards to obtain mortality rates, which would have allowed determination of the relationship between mortality rate and the PCT and CRP serum levels. Another limitation of our study is that we could not include all patients with CAP or acute exacerbation of COPD who were admitted during the study period. Sample collection was performed only between 8am to 4 pm; thus, we did not include the entire number of patients with CAP or acute exacerbation of COPD who were referred to the ED. Nevertheless, our results indicated statistical differences in the PCT levels that could differentiate CAP from acute exacerbation of COPD in an ED setting. Therefore, we consider that the main risk factor for acute exacerbation of COPD is viral infections and this factor can be reflected in the serum PCT results. More studies with more cases are recommended to verify these findings. The researchers thank the deputy for research and technology, Tabriz University of Medical Sciences, for support provided for this project. The authors are grateful to all the health personnel and patients who participated in the study, in addition to the data collectors, supervisors, and administrative staff of the emergency department of Imam Reza hospital. We also express our sincere appreciation to Mrs. Robab Mehdizadeh Sfanjani for the statistical analysis provided for this manuscript. This article was written based on a dataset of an MD thesis, registered in the Tabriz University of Medical Sciences. Authors’ Contribution: Ali Taghizadieh and Hassan Soleimanpour designed and coordinated the study, participated in most of the experiments, and prepared the manuscript. Farzad Rahmani provided assistance for all experiments. Kavous Shahsavari Nia and Hossein Khodaverdizadeh provided assistance in the design of the study, coordinated and carried out all the experiments, and participated in manuscript preparation. All authors have read and approved the content of the manuscript.